i love this new outfit! i can’t wait to repeat it, but i’ll have to wait until the weekend so my coworkers don’t notice. i kind of look like a safari guide, but i don’t care! we had a house showing over the weekend (yeah!) and had to get out for a while. we moseyed to the mall and found that banana republic was having an extra 40% off their sale items until 1 p.m. score! i helped eric look around, with no luck. we almost left the store, and then i decided i better take a peek. i ended up getting both these tops. 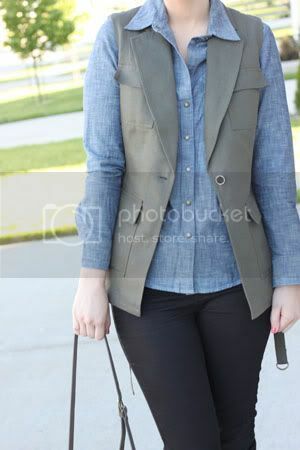 a denim shirt had been on my “wants” list since november! 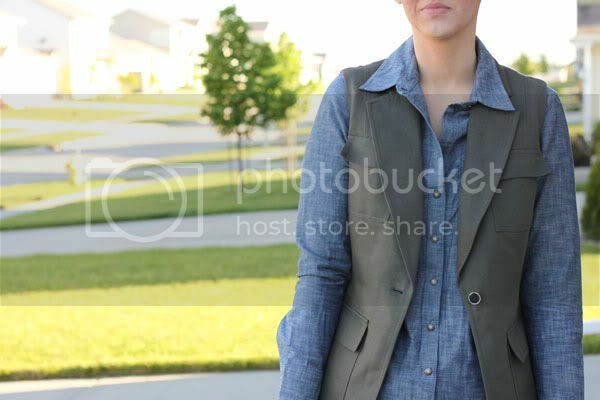 i got it for $28 (originally $70) and this vest for $18 (originally $98). i’m betting my momma is really proud of my sale-shopping! i sure was.